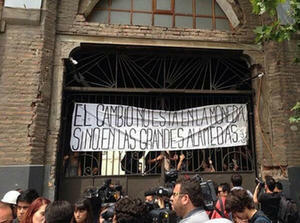 Students occupy Bachelet campaign headquarters. Credit: informador.com.mx. The promise of structural reforms to address the deep divide between rich and poor in Chilean society propelled Bachelet and her center-left New Majority coalition to a landslide victory in December over Evelyn Matthei, candidate of the center-right Alliance. While Chile has the highest rate of economic growth among 34 developed countries, it is also the most unequal. Bachelet campaigned on a radical platform of educational, tax, and constitutional reform to redress the injustices of a political and economic system inherited from the dictatorship era, that largely favors the wealthy. After failing to gain a majority on the first ballot in November (in a field of nine candidates, including seven to the left of center), Bachelet handily won the run-off election with 62% of the vote, the biggest presidential victory in eight decades. Despite this seemingly broad mandate, she now faces formidable obstacles in seeking to deliver on her campaign promises, as Chile’s undemocratic institutions and alienated electorate—both enduring legacies of dictatorship—conspire to discourage change. Most of Chile’s problems today have their origin in the anti-democratic structures established by the 17-year dictatorship of Augosto Pinochet and left largely intact by successive democratic governments (of the center-left and center-right) since Chile’s “return to democracy” in 1990. These include a constitution (imposed after a fraudulent referendum conducted under a state of siege) and a set of organic laws that enshrine the power of conservative elite minorities, an electoral system that perpetuates their disproportionate representation, and a deregulated economy affording wide latitude and subsidies to the private sector. As the intense electoral campaign converged this past fall with the 40th anniversary of the military coup that overthrew Allende, the election seemed to be as much a referendum on Chile’s tormented past as on its future direction. The dramatically contrasting but intertwined family histories of the two presidential candidates—Bachelet’s father, an Allende loyalist general, died under torture in a military school run by Matthei’s father, a member of Pinochet’s junta—kept the past front and center despite the candidates’ efforts to refocus on the future. In the run-up to the 40th anniversary, Chileans were bombarded with graphic images of the coup, repression, and resistance though previously unseen documentary footage, dramatizations, and debates widely broadcast through the mainstream media. The avalanche appears to have captured the popular imagination, especially among the 60% of Chileans born after the coup (and others who “saw but did not see”). Polls show that only 16% of Chileans now think the coup was justified, down from 36% a decade ago. Even the most conservative institutions have recently offered at least symbolic gestures of remorse, such as the official closing of a luxury prison resort for high-ranking officials convicted of human rights offenses, the public apology issued by the National Association of Judges, and the National Education Council’s recommendation to substitute the term “dictatorship” for “military government” in school textbooks. Students march in Valparaíso. Credit: Ben Achtenberg. But it is the highly mobilized Chilean student movement that has genuinely challenged Pinochet’s legacy by catalyzing popular demands for institutional reform. Through massive protests and school takeovers beginning in 2011, and continuing to this day (with widespread public support), students have highlighted the inequities of a dictatorship-era educational system that features private sector subsidization, vast discrepancies in the quality of municipally-controlled primary and secondary schools based on social class, and the highest university student cost burden of any developed country. Joined by trade unions and other popular sectors, they have articulated transformative demands that governing political elites (including Bachelet herself, in her first term) have not dared to address during 20 years of democratic transition. These include a return to universal, free, high-quality public education (which students had under Allende), a revival of the public pension and healthcare systems, progressive tax reform to finance social spending, and a refounding of the Chilean state through a new constitutional assembly. While the student organizations did not endorse a presidential candidate, Bachelet sought and won the support of several prominent ex-student leaders running for Congress on the Communist Party and other splinter left tickets, including popular activist Camila Vallejo. In exchange, the New Majority partially incorporated the students’ demands in its platform, pushing the electoral agenda substantially to the left. For the first time since the return to democracy, the Communist Party joined the center-left political coalition, giving Bachelet the opportunity for a sufficient Congressional mandate to push through her promised reforms. The campaign raised high expectations for systemic change, as well as the political cost of failing to deliver. In the end, the New Majority picked up slim majorities in both houses—55% in the Senate and 56% in the House—thanks in part to the election of Vallejo and other student and activist candidates. But the coalition did not achieve the super-majorities required by Pinochet-era laws to reform the educational system (57%), the electoral system (60%), or the constitution (67%). One reason is the binomial electoral system itself, which awards the losing coalition half the seats in each Congressional district unless the winning one secures more than two-thirds of the votes. This may explain why both the New Majority and the Alliance ended up with similar numbers of deputies despite the lopsided presidential results (in November’s first-round presidential race, when the Congress was also elected, Bachelet nearly doubled her conservative rival’s vote). A record-low voter turnout, in the first presidential election since a 2012 rule change made voting voluntary, also likely worked against the New Majority’s Congressional aspirations. Only 51% of the voting age population cast ballots in November, with the highest abstention levels reported in the economically-depressed northern and southern regions and among youth. An estimated 60% of those in the 18-34 age group, arguably among the most likely progressive voters, stayed home. 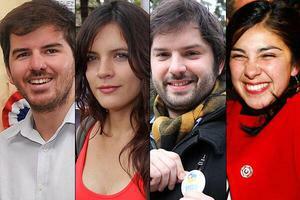 Four student leaders elected to the Chamber of Deputies. Credit: @paula_benedit, Twitter; Santiago Times. While the voter abstention phenomenon—especially among youth—is certainly not unique to Chile, the sustained level of participation achieved in recent student mobilizations suggests that it is more a function of alienation from traditional politics than apathy. Surely, an electoral system that distorts votes by design and furthers minority vetoes is not conducive to voluntary participation. Melissa Sepulveda, newly elected leader of the University of Chile’s student federation, explained that she would not vote because “the possibility for change isn’t in the Congress.” Chileans, she argues, are disillusioned by the manner of conducting politics since the return to democracy. With this mixed electoral outcome, New Majority initiatives such as tax, pension, and healthcare reform, which require only a majority vote, should be achievable. Radical educational reform may also be within reach, if independent delegates can provide the critical swing votes. But political and constitutional reforms, if attainable at all, will require bargaining, negotiation, and compromise with more conservative factions, at the risk of alienating progressive popular constituencies. Within the New Majority coalition itself, there are diverse party factions ranging from Christian Democrats (many of whom originally supported Pinochet) to Communists, with significantly different visions, strategies, and timetables for reform. Internal conflicts are intensified by continuing pressure from the social movements. In the area of education, Bachelet (a member of the Socialist Party) has promised to institute tuition-free public higher education and end state subsidies to for-profit institutions within six years. But students and their elected representatives want to abolish private schools completely, and are impatient for quick results. A key split has also arisen over the issue of how constitutional reform might be accomplished. While the Christian Democrats and Bachelet support the institutional strategy of “change from within,” relying on the undemocratically-elected Congress to produce a new constitution, students and other popular sectors, supported by the Communist Party, are calling for a constitutional assembly to be convoked by referendum. Organizing for a constitutional assembly. Credit: Emily McHugh, Santiago Times. Under a grassroots initiative called “Mark Your Vote,” more than 10% of Chilean voters voluntarily marked their ballots “AC” in the December election, to evidence support for this strategy. Given the initial confusion as to whether the marked ballots would be accepted as valid, the difficulties in tallying them, and the requirement that only ballots clearly designated for a presidential candidate would be considered, organizers believe that the results significantly understate the proposal’s appeal. 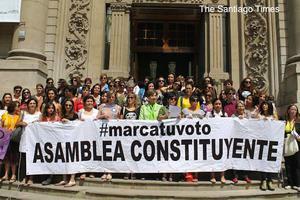 In a recent national opinion poll, 45% of those surveyed expressed support for a constitutional assembly. As a strategy that offers the possibility of re-engaging a civil society that is profoundly alienated from the consensus model of post-dictatorship duopoly politics, the constitutional assembly is an intriguing option. It could provide an opportunity for Chileans to reconnect with their own deeply democratic traditions, illustrated by the unprecedented levels of political and social awareness and participation achieved through poder popular (popular power), the touchstone of Allende’s Popular Unity government. Despite the new discourse of remorse evidenced during the 40-year coup anniversary, many Chileans feel that this aspect of their past has been largely excised from official historical memory. Even in the otherwise outstanding Museum of Memory and Human Rights developed by Bachelet in her first term, there is little reference to the participatory institutions of the Allende era (such as workers’ councils and collective neighborhood organizations) that Pinochet systematically destroyed. A revival of this deeply democratic tradition through the constitutional assembly could be an important step in genuinely challenging the legacy of dictatorship. The same rule change also made voter registration, which had previously been voluntary, automatic. For this reason, it is preferable to measure voter turnout over time as a percentage of the voting age population rather than as a percentage of registered voters, which is distorted by the rule change. Emily Achtenberg is an urban planner and the author of NACLA’s Rebel Currents blog (nacla.org/blog/rebel-currents). She observed the 40-year coup anniversary in Chile with an SOA Watch solidarity delegation.